It was our third visit to Gir National Park. We started our morning safari at 6 o’clock. While entering into park we discuss with our guide that we are interested in lion but more in birds. 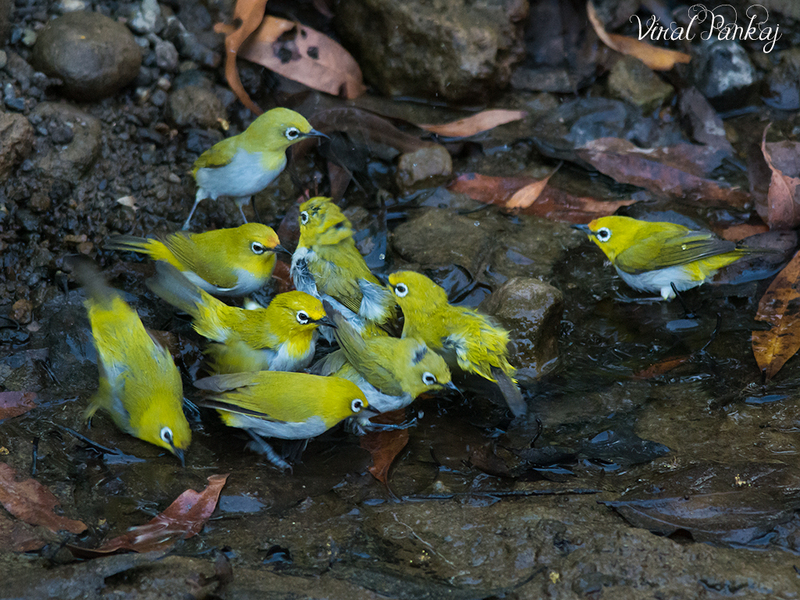 While passing through the track near a water-stream we saw flock of Oriental White-eyes and they were bathing…! It was early morning but atmosphere was pretty warm on that day. Oriental White-eyes settled in the water and took a cool shower, after a hasty dip, quickly shook itself dry of the excess water and flew away or sat at the water’s edge. Some others were take their place to quench thirst or take a quick dip. They were all very excited to be around the water and were waiting for own turn to take the plunge. Very soon more of them joined for morning bath and we were happy to freeze them in the act. It was amazing to see these birds thoroughly enjoying their bath. We enjoyed until we realized that we were stopping by the water stream for almost 30 minutes. Then we quickly record the moment and decided to go further in search of lion. Oriental White-eye is identified by the distinctive white eye-ring and overall yellowish upperparts. This bird is small (about 8–9 cm long) with yellowish olive upper parts, a white eye ring, yellow throat and vent. These white-eyes are sociable, forming flocks which only separate on the approach of the breeding season. Oriental white-eye will also eat nectar and fruits of various kinds. This little cute bird looks too pretty in morning light. We never saw them in this much number especially bathing altogether. They were continuously chirping, bathing and drinking water one by one, systematically preforming all actions so swiftly…! Whenever we recall the trip the whole scene just come up in our mind.